Save £100 on Sonos Playbase | What Hi-Fi? 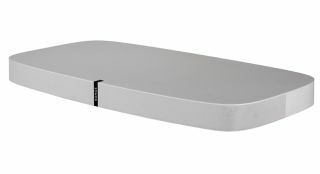 With the excellent Sonos Beam now on sale, a price drop in the Sonos Playbase was perhaps inevitable. The white Playbase is now available for £599 - a £100 saving over the original £699 price. Amazon, Sevenoaks and Peter Tyson are currently offering the lower price, although as this isn't an 'official' Sonos discount, the manufacturer's own site hasn’t followed suit. So if you’re in need of a solid, authoritative and big-sounding soundbase and haven’t already spent your wages earlier this week on Amazon Prime Day deals, this could be a good way to empty your wallet.